As we move into March for 2018 we start off with Jupiter turning retrograde just inside the cusp of sidereal Scorpio, and then retrograding back into Libra and not re-entering Scorpio until October of this year. So we get a taste of possibly the higher-leveraged success that is potential with Jupiter in Scorpio, but it doesn’t really kick in until much later this year. Jupiter in Libra is more of a relational and refining type of energy, hopefully bringing elements into balance before they undergo the Scorpionic stresses and intensity. Jupiter is retrograde from March 9 to July 10, 2018. More information on retrograde periods go HERE. I have a whole document that addresses the transits of Jupiter for each sign for 2018. It’s completely free, you just have to sign up for my email newsletter to get it. Get it HERE. Mercury stationary retrograde this month takes place in its sign of debility, Pisces, and receiving Vedic square from Mars in Sagittarius. This could be a particularly problematical Mercury retrograde period: miscommunications, setbacks and delays in affairs, and maybe slightly harder to get past biases, predispositions and overall mental and emotional dysfunctions. 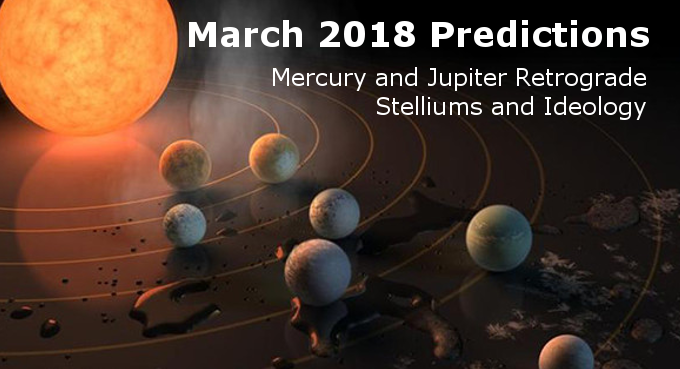 The Mercury retrograde period runs from March 22 to April 15, 2018. Just prior to Mercury making its regular retrograde station (occurring about three times a year) we have the Vernal Equinox. The Vernal Equinox is when the times of day and night are equal, hence the name equinox. For those in the Northern Hemisphere it is the first day of spring; and for those in the Southern Hemisphere it is the first day of autumn. One side starts to receive more sunlight, the other starts to receive less. The world is a macrocosm to our microcosm. We have our periods of emergence (spring), peak activity (summer), harvest (autumn), and then sleep/hibernation (winter). Every day we repeat this eternal cycle: awakening, the work day, recreational evening, and then sleep/rest. Life as One Whole Living Thing, reflects it infinitely upward and downward. The Vernal Equinox is also the beginning of the tropical, or Western, zodiac; where they mark off the first degree of Aries. I won’t get into the seasonal verses stellar approach to astrology here, but you can read more about that HERE. 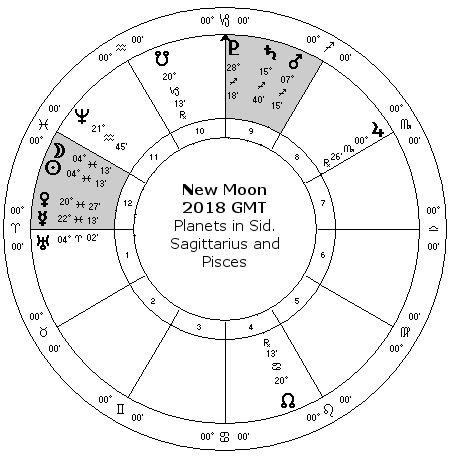 In looking at the configurations of the planets for this month, I notice that on March 13 as the Sun enters sidereal Pisces, there will be a concentration of planets in both Sagittarius and Pisces (see image). During the new moon on March 17 there will be four planets in sidereal Pisces. A concentration of three or more planets in any one sign is called a stellium, right now we be having two stelliums. As a reaction to this particular juxtaposition of planets we may be moving through ideological (Sagittarius) and then spiritual or dissolutionary spaces at the same time. Over the last few months in the US we’ve sexual harassment in the media and industry, and lately with gun control in the Florida school shooting. Looking at the picture above, with heavyweights Mars, Saturn and Pluto in Sagittarius there may be some heavy-handed implementation of partisan policies, with any amount of philosophical/religious motivation behind it, being brought to bear on us. With the lighter-weight Sun, Mercury and Venus in Pisces, the reaction might be “Oh, well, what can you do.” Or, perhaps, “Yeah, okay, that seems to be right with me”, when statements or thoughts are on very questionable, very biased, or simply erroneous. Sometimes we like to have people do the thinking for us, but it’s very dangerous. The full moon of March 31 then falls in Virgo, which then forms a t-square to the Sagittarius-Pisces planets, setting them off somewhat, possibly making a somewhat more intense end of month, leading into April. No aspects forming today, but Mercury is at greatest distance from the Sun. Realization, communication, and brilliance are highlighted. The dark moon leaves us temporarily bereft of it’s illumination, albeit illumination of a lesser light. We all “turn the corner” of the seasons, entering a new quadrant of terrestrial experience. Our brothers and sisters to the south/north turn to the opposite pole of season. Either the day or the night now attains supremacy, with life appropriately expanding or contracting. It’s a universal rhythm, yet the equinox we are now in reminds us to be “in balance”, to be in perfect equipoise, unaffected by extremes or externalities. Venus biquintile Jupiter today help us to more truly experience that state of grace, which can be the open door to all good fortune. 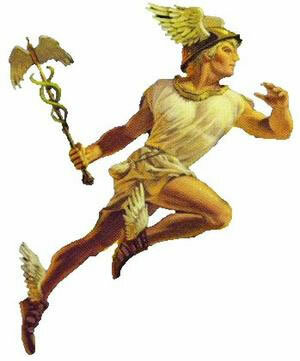 Mercury, the trickster god, stands still in the sky apparently, shifting to backwards gear. The perception and experience of life might be a little more internal or subjective for the next three weeks or so. Mars quintile to Neptune, can help to put a dysfunctional “happy face” on some serious deceits, either what we send out or accept. What some people might see as weakness, may more truly be a great strength underneath. Things get a little hotter for lovely Venus, now entering sidereal Aries, also quincunx Jupiter today. New, exciting experiences may start today. Other that the Moon at it’s monthly closest approach to the Earth (us), no peaking influences. Jupiter steps back into sidereal Libra until next October, the effects are lighter, more cordial, perhaps excessively so. Relationships and interactions may take on a slightly more adventurous tone. Illumined by the reflected sunlight of the Moon, we’re ushered into April.